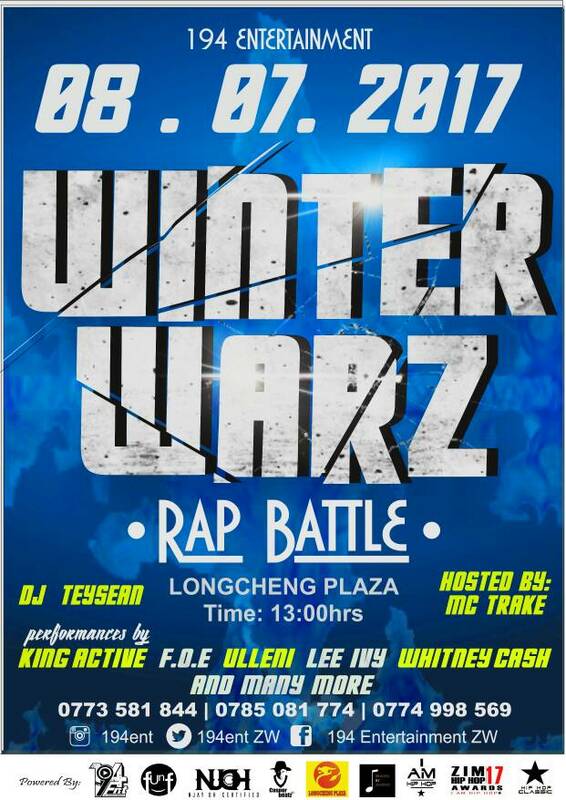 The good folk at 194 Entertainment Zw have announced the second edition of their annual rap battles will be happening at Long Cheng Plaza on the 8th of July 2017 at Long Cheng Plaza.The event which seeks to shine a spotlight on bars hot enough to chase away the winter blues will be hosted by Mc Trake with Dj Teysean on the decks.Perfomances slated for the day include King Aktive,FOE,Whitney Cash and Lee Ivy and a a few suprise acts whose identities remain a secret at this point. 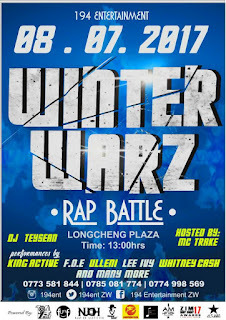 These rap battles are a bit different from your usual battle because 194 has partnered with a lot of brands and individuals to come up with a raft of impressive prizes for winners and participants in general.The Zim HipHop Awards,Long Cheng Plaza,Fun F and Cassper Beatz are some of the brands contributing in one way or the other towards the success of the event.The overall winner will walk away with a 10 track album,photoshoot,100 printed CDs,video shoot as well as editing plus 194 merchandise and profiling.The runner up is also covered as they are set to receive beats from Fun F and Casper Beatz,50 printed CDs and 194 Ent merchandise.As if that wasn't epic enough each and every rapper participating in the battles will receive free merchandise and beats from Fun F and Cassper Beatz. 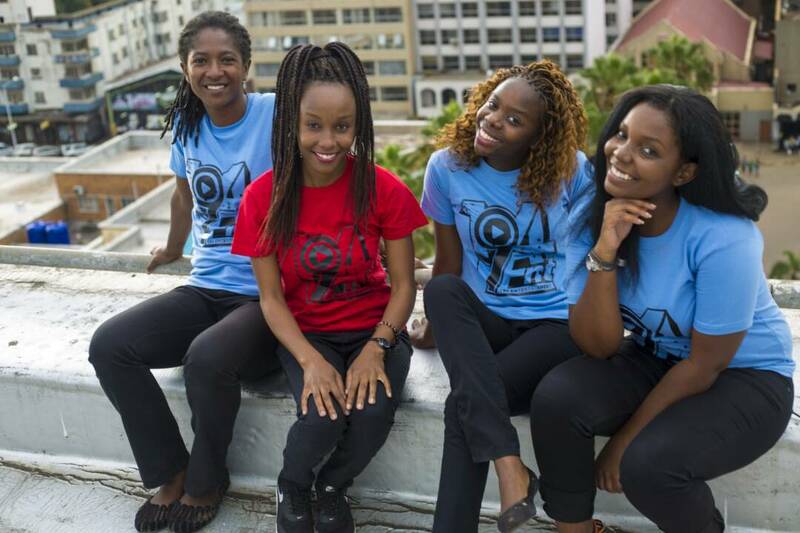 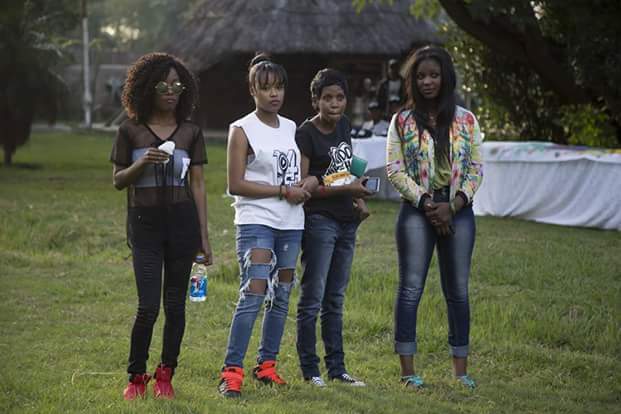 The battles are a brainchild of 194 Ent Zw which is an all female ensemble dedicated to pushing Zimbabwean HipHop through events Management and conceptualizing said events.The team is made up of Tafadzwa Nhandara the managing director,Donatha Nhandara events coordinator,Fadzai Chiweshe the CEO and Lillian Chaerera the Media Relations Officer.The quartet has a vision to promote growth of the local HipHop industry hence their prizes add value to the participants and give a platform that exposes rappers to a wider consumer base.Some of the events they have been part of include Rap City,HipHop In the Sun and a string of album launches with King Aktive's One Ari Ega mixtape launch being the latest.